Northwestern State coach Donald Pickett implored his softball team for a fast start Wednesday at Louisiana Tech, and that’s exactly what he got en route to a 7-4 win. NSU (19-19) scored its seven runs in the first three innings and held off a powerful Lady Techsters (31-10) offense in the latter innings. Sophomore E.C. Delafield started the NSU scoring with a two-out single to score Cayla Jones, who reached base on one of her two hit-by-pitches. NSU piled on two more runs in the second inning on a Jones two-run home run. Jones, who has a team-high seven home runs this season, went 2-for-2 with two runs scored, two RBIs and reached base in all four plate appearances. The second baseman handed her home run ball to a group of young NSU fans who made signs for the game, including one that asked pitcher E.C. Delafield to his prom – in 2031. Delafield via Twitter replied “How could I say no?” and Jones said it’s great to see support on the road. NSU’s big inning came in a four-run third inning highlighted by a Maggie Black three-run home run. Riley Cantrell drove in the inning’s first run to score Alexis Perry, who singled to lead off the inning, as NSU grabbed a 4-0 edge. Black’s fourth home run of the season also plated Delafield (singled) and Cantrell for the 7-0 advantage. Delafield, Perry and Kaitlyn St. Clair joined Jones with two hits each as they provided eight of NSU’s 10 hits. 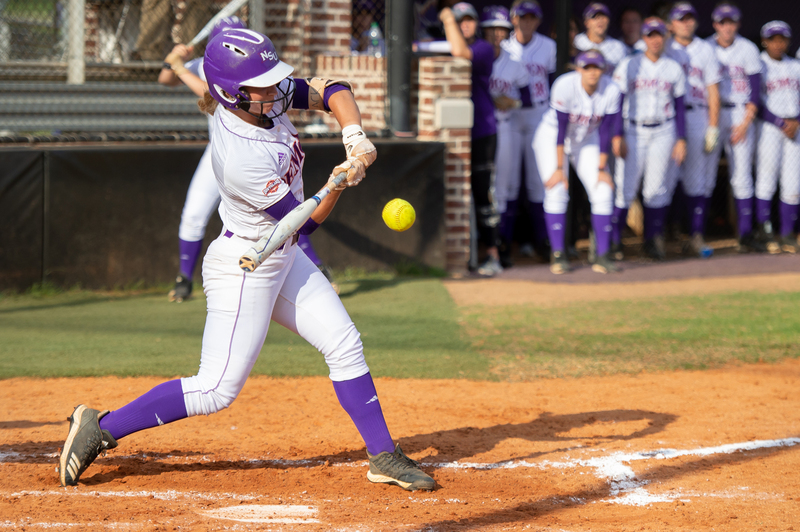 The Lady Demons halted a four-game losing streak in the series against Louisiana Tech, which included an 11-3 Tech win in five innings in Natchitoches on March 20. On Wednesday, NSU pitcher Samantha Guile (7-8) made the lead stand up by scattering nine Tech hits and avoiding a huge inning against a Lady Techster offense that ranks 17th in the country in runs per game. With the bases loaded and one out in the third inning, Guile surrendered just a single run on a ground out. Guile shook off a Jazzlyn Crowder two-run home run in the fifth inning (7-3 NSU lead) and allowed just one more run (an A.J. Williams bunt single RBI) in the sixth inning. With the junior aiming to secure the win in the seventh inning, she endured a 20-minute delay when the lights down the left-field line shut off. Guile finished the job, working through the No. 2-4 hitters in the seventh inning in her team-high seventh win of the season. “I felt like my team was out there doing a great job, and everybody was clicking,” Guile said. “My defense behind me came up with plays in pressure situations. Guile struck out five as she allowed four runs (three earned) with nine hits and two walks. NSU gets back into Southland Conference play when it hosts Texas A&M-Corpus in a Friday doubleheader at 3 p.m. and a Saturday finale at 1 p.m.